But you may be lucky to have a friend with a lemon tree and they’re probably more than happy to let you take a few off their hands… although none of my friends in Paris seem to have lemon trees growing in their apartments, unfortunately. And if you live where Improved Meyer Lemons are available, by all means feel free to use them instead of the more common Eureka lemons. I like to finely dice preserved lemons and mix them with sautéed vegetables, such as green beans, fava beans, or to elevate lowly rounds of carrots into something interesting and exotic, perhaps tossing in a few cumin seeds as well. They’re also good mashed into butter with some fresh herbs, then smeared on top of grilled fish or a nice hunk of caramelized roasted winter squash. And I’ve been known to sneak some into a batch of tapenade, as well as adding some finely-chopped little pieces to a batch of lemon ice cream too! 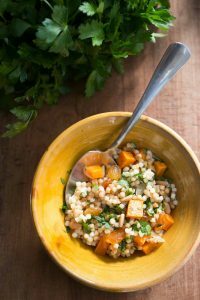 For the big Christmas party his year, I made one of my favorite recipes, Israeli Couscous With Roasted Butternut Squash and Preserved Lemon to go with the Lamb Tagine that I cooked the day before…which made entertaining 15 ravenous Parisians a breeze. And speaking of braised meats or tagines, you can add thin strips of preserved lemons to any braising liquid during the last few minutes of cooking, which adds a nice little bit of bright, lemony flavor to whatever you’re cooking. But do take care when adding them to a recipe; hold back on adding salt since the lemons will certainly add quite a bit more salty flavor than you think. Always use organic or unsprayed lemons, since you’re going to be eating the exterior (and I don’t want to lose any of my readers prematurely.) I generally do 8-10 lemons at a time, but be sure to buy a few extra lemons for juicing a couple of days later, in case you need to add additional liquid to keep the lemons in the jar submerged while they ‘do their thing’. And never use ordinary table salt, which has a harsh, chemical taste. (Check the ingredients to make sure your salt is pure.) As always, I recommend sea salt or kosher salt. 1. Scrub the lemons with a vegetable brush and dry them off. 2. Cut off the little rounded bit at the stem end if there’s a hard little piece of the stem attached. From the other end of the lemon, make a large cut by slicing lengthwise downward, stopping about 1-inch (3 cm) from the bottom, then making another downward slice, so you’ve incised the lemon with an X shape. 3. 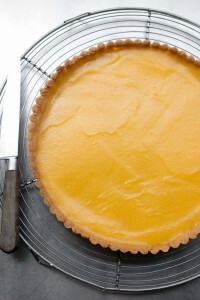 Pack coarse salt into the lemon where you made the incisions. Don’t be skimpy with the salt: use about 1 tablespoon per lemon. 5. Press the lemons very firmly in the jar to get the juices flowing. Cover and let stand overnight. 6. 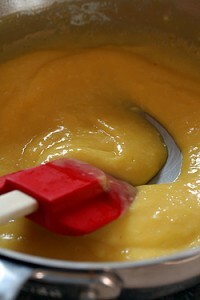 The next day do the same, pressing the lemons down, encouraging them to release more juice as they start to soften. Repeat for a 2-3 days until the lemons are completely covered with liquid. If your lemons aren’t too juicy, add more freshly-squeezed lemon juice until they are submerged, as I generally have to do. 7. After one month, when the preserved lemons are soft, they’re ready to use. Store the lemons in the refrigerator, where they’ll keep for at least 6 months. Rinse before using to remove excess salt. I love love love LOVE love LOVE love love preserved lemons. Did I mention how much I love them? I started doing these from Paula Wolfert’s Moroccan cookbook about 15 years ago, and they work! (I shouldn’t have been so surprised) Pickled lemons are a decent substitute for achar, too. My latest jar is 8 years old (I was undecided) and I finally started using it this year for a knockout red lentil dal. The lemons were fine. The only thing I’d add is never fish the lemons out with fingers–only a very clean fork. If you add extra lemon juice and salt and a little olive oil to the top of the jar when you first put them in and get out any air bubbles, you don’t have to reopen it and mess around, just set it upside down every other day or so that month (gotta trust your seals, though). Preserved lemons are the best. I have a batch made with regular organic lemons that we’ve been using, and another batch with meyer lemons that’s in the process of curing now. I’m really looking forward to comparing them once the meyers are ready to eat. Matt: What’s a Bloody Mary? Danielle: Let us know how your Meyers turn out. Their thin skins leads me to think they might get a bit too soft, and their sweetness might make them lose some of their ‘bite’, so I’m interested in hearing back. Kitty Morse, the Moroccan cookbook author uses them for hers, though, so I hope we’ll be pleasantly surprised with your results. I have, since 1976, used a Moroccan-Jewish recipe from Safi which calls for spices such as you have indicated. I dragged home a big glass jar of (unspiced) lemons from Tangier long ago. Not worth the the considerable effort. Mine have always tasted better but I was disappointed in my preserved Myer lemons. The skin was too thin, I felt. I have a tree laden with ripening Myer lemons but none will be preserved this year. Too scarce, too rare, too sweet a treat to be salted down and mercilessly mooshed into a Mason jar. I guess I take the garden-variety low road when it comes to preserving lemons. How is it that the pan juices from a chicken roasted with preserved lemon are so very satin-y? Strangely wonderful chemistry at work there. I bought a Moroccan cookbook several months ago and I’ve been thinking about trying the preserved lemons. I’ve never tasted one so I don’t really know what I’m missing. But your post has definitely convinced me to try making some! Thanks! Oh, but I preserve Meyers, and still have some left from last winter. They’re not at all mushy after almost a year in the fridge, and they’re still utterly delicious. So just a voice of dissent here, for what it’s worth. Hi again David–I didn’t can the lemons under heat or vacuum or anything, I’m not that good either. Don’t know what the heat would do to them–probably spoil them faster by breaking the cells down without saturating the salt throughout. I did pour boiling water over the mason jar parts first–lab training or kibbutz kitchen mythology, who knows? (quick! boil the fingers!) Re previous posts, I hope you had a great birthday and have recovered from the chocolate-sated Kouign Amann I picture as your ideal cake (ok, so that’s nightmarish or sacrilegious or something). I’m inspired to make preserved lemons – I can/pickle/freeze lots of foods but have never tried these. I love lemon in almost everything (not chocolate). Quick and painless way to sterilize jars is to wash them, then put them in a 125C (250F) oven for 10 minutes. They are easier to handle if not dripping with boiling water. You know, ever since I read this post I’ve been having a jones for lemon this and lemon that (to paraphrase my favorite musician, Boz Scaggs.) Guess I’ll have to go make something lemony, if not preserved lemons. Thanks, David. Oh my… I was recently gifted with a jar of preserved lemons, and I’ve been holding off on using them, I’m afraid to waste a precious bite. It never occurred to me to try making my own. Thanks for sharing! David… lemons are much better than sea monkeys! Although I have never tasted a sea monkey…. I learned to do mine in slices, from a Moroccan girl nearby where I am in Tuscany, she also mentioned that her mom sometimes freezes the lemons to speed them along. I use extra virgin olive oil to cover the top too, and preserve them even just a little more! I don’t throw away the lemon part, but also use it in my dishes. It does give a real WOW to anything it is served with. I’ve always wanted the recipe for this! Thanks. thanks for your suggestions for chocolate places in Bayonne-also found some magnificent pates de fruits and Gateau Basque there. David, you DO have a friend in Paris who has a fruit-bearing lemon tree in her apartment: me! Unfortunately, though, it’s a small tree and the output is not enough for both of us. 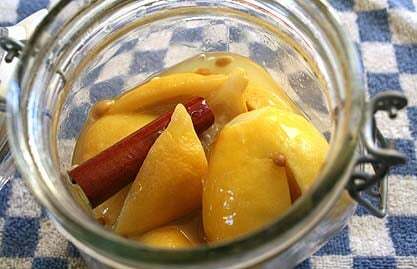 I’ll share my preserved lemons with you the next time you are over, though, as you so kindly shared the recipe!! i made some preserved lemons at the end of last year when a friend offered a few branches full of lemons. i recently used some in a chicken, olive and preserved lemon tagine – yummmm! thanks for ideas on how else i can use them. It is so wonderful to see experienced chefs with some clout publish basics with which people can make ingredients. In the flurry of gussied up recipes and exquisite photography, it sometimes is forgotten that the bechamel must be conquered before the “Citrus and liver with ginger slices and chocolate nibs soufflé” is attempted. Preserved lemons can open doors to worlds not previously dreamed. Good on you, David!